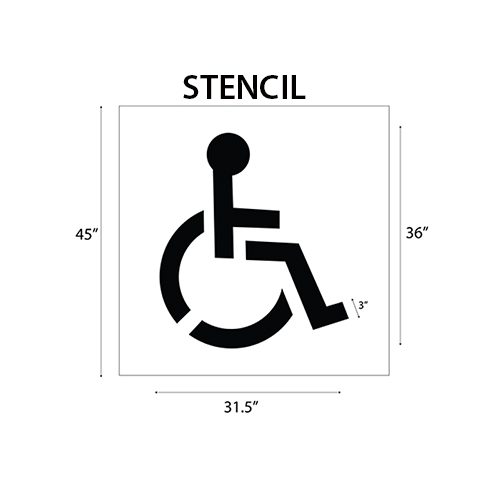 Looking for Handicap Parking Signs and Pavement Stencils? Then you’ve come to the right place. StopSignsAndMore.com sells ADA-compliant handicap parking signs including the must-have California disabled parking signs for those who operate businesses, properties or other organizations in the Golden State. 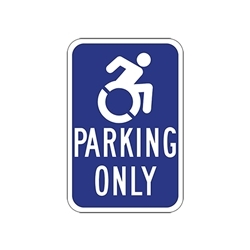 In 2008, a revised ADA ruling in California states that each required ADA parking space must have an updated handicap parking sign as well as updated ISA wheelchair symbols on the pavement. To meet these new requirements, StopSignsAndMore.com now sells these new reusable stencils. These on-the-pavement handicap parking sign must be 45-inches in height with the wheelchair pictogram being 36-inches in height. Required white-paint borders can easily be added to the stenciled pictogram as well. The purpose of the new pavement parking sign is to make the symbol visible even when a car or van is parked there. Because the new pavement disabled parking sign that was implemented by the state is not noticeably different from previous ones to most people, you might be tempted to overlook the upgrade. Yet as a result of all the lawsuits in the state related to California handicapped parking signs and other ADA concerns, business owners who ignore the update do so at their own peril. Would you rather spend a few hundred bucks to update the stenciled ADA parking sign or risk spending thousands of dollars in fines? Businesses who fail to comply with ADA requirements are being targeted by costly frivolous lawsuits. The stencil version of the handicapped parking signs is easy to install and comes with clear instructions. No artistic ability is required. Other than the white and blue spray paint and perhaps painter’s tape to ensure straight lines, no other special equipment is needed. Order yours today and reuse it multiple times to save even more.